Authorities in the Philippines have begun evacuating thousands of people living in the path of Typhoon Mangkhut. The storm is currently on a path towards the northern tip of the main island of Luzon, carrying maximum sustained winds of 205 kilometers an hour - the equivalent of a Category 5 Atlantic hurricane - and wind gusts of 255 kilometers an hour, making it the strongest of 15 storms to reach the archipelago this year. Mangkhut is forecast to make landfall on Luzon on Saturday. 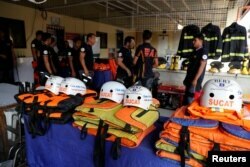 Rescuers ready their gear before Super Typhoon Mangkhut hits the main island of Luzon, in Muntinlupa, Metro Manila, Philippines, Sept. 13, 2018. Emergency crews began evacuating people living along coastal areas Thursday, and local officials have ordered all schools and offices closed. Mangkhut has already passed the U.S. territory of Guam, where it caused widespread flooding and power outages. After striking the Philippines, the storm is expected to move on to Taiwan before heading to Hong Kong and southern China by Sunday. According to the United Nations Global Disaster Alert and Coordination System, it could affect as many as 43.4 million people before it subsides.